Adopting healthy habits like eating healthful foods and exercising can seem difficult, but sometimes it can be quite easy. There are some health tips and wellness habits we can easily change in a day’s time to improve our health absolutely. 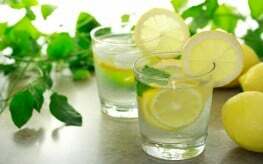 Things like drinking water with lemon are easy to implement and can provide many health benefits. In addition to offering mind-boosting hydration, lemon water provides immune-boosting vitamin C and antioxidants. It is a great way to wake up and an excellent way to wind down your day. It’s low in calories and is a good source of potassium and pectin. Perhaps best of all, lemon water is easy to make and lemons are easy to find. 1. Immune-boosting benefits of vitamin C help ensure your body can fight off illness. 2. Despite lemons being acidic, they can help keep your pH balance in check. 3. Pectin fiber is great for your colon and digestive health. 4. Encourages the production of bile. 5. Dissolving uric acid, lemon water can help reduce pain and inflammation of the joints. 6. Good for your skin. 7. Helps to maintain eye health and protects against eye disease and damage. 8. Helps replenish the body after a tough workout. 9. Aids in weight loss. 10. Helps detoxify the liver and kidneys. 11. Helps kill bacteria in the mouth and can be used as a natural teeth whitening home remedy. 12. Can reduce the occurrence and aid in the treatment of urinary tract infections. While many people think of ice cold lemon water as the best refreshment, warming the water is actually better. When you drink warm water, your body doesn’t have to work to raise the temperature and it can soothe you like a cup of tea or wake you like a cup of coffee. Adding warm lemon water to your daily routine is a small and simple step towards better health. It doesn’t require any expensive additions or restrictions, merely adding a tasty fruit to your daily hydration. “It’s low in calories….” calorie count in fruit is not relevant, same goes for vegetables. Good fruit and veg plays zero part in obesity or being over-weight. A calorie is not a calorie, all are not the same and act on the body is the same way. I read that both lemons and limes are alkaline inside the body. What is the real story?